Scrubs is one of the few television shows I watch with great devotion.Â Another is Gossip Girl, but have you seen Blake Lively lately?Â How could someone not be devoted to that show?Â The best part is that, due to syndication on some of my local channels, I can catch Dr. Dorian and his pals for three hours a day, plus some episodes Iâ€™m sure are on when Iâ€™m at work.Â Because of that, I have seen almost every episode ever made and all so funny.Â Now yet another season is available on DVD. 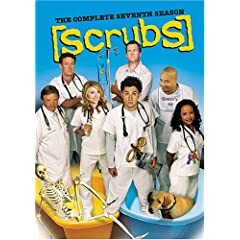 Starting this November 11th, now available as a DVD boxed set from ABC Studios and Paramount Studios Home Entertainment comes the next season of the best funny show about hospitals.Â Scrubs â€“ The Complete Seventh Season is ready to poke out of your television screen and bring its patented zany style of humor into your living room.Â Bring home this hilarious and touching show today! JD and his girlfriend are having a baby, but he isnâ€™t that in love with her and once she finds out, it really hits the fan.Â Kelso is finally forced to retire, but he sure takes his sweet time.Â The Janitor listens to Al Gore and becomes far too intense about saving the earth.Â Eliot breaks up with Keith, then gets back together and then breaks up again.Â And that is only a few of the highlights of the hilarious and heartwarming occurrences of these eleven episodes. The special features included in this DVD boxed set are a look behind the scenes at the fairytale episode which Zach Braff directed, an all-new interview with Ken Jenkins, the actor who plays Bob Kelso, some alternate lines from each episode, a selection of deleted scenes and some bloopers and optional audio commentaries. I love this show.Â There are few other shows that are able to so aptly mix transcendent humor and a selection of very serious issues and this show does it so very well.Â The Janitor is always a treat, especially after they made him funnier and less way too strange.Â Kelso is completely hilarious in this season, something we have had to wait far too long for.Â Zach Braff is a comic genius and I am excited to see where else his many talents are going to take him after this show.Â Eliot is one of the most beautiful women on television right now, especially with her long hair. Thatâ€™s just wonderful. Scrub up and get ready for this fantastic boxed set! This DVD boxed set is available at Amazon.com. 1 user commented in " Movie Review: Scrubs â€“ The Complete Seventh Season "